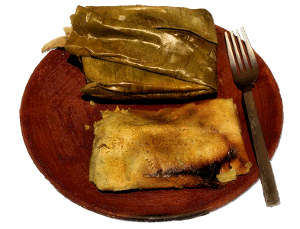 A tamale (Spanish: tamal, Nahuatl: tamalli) is a traditional Mesoamerican dish made of masa or dough (starchy, and usually corn-based), which is steamed in a corn husk or banana leaf. The wrapping is discarded before eating. Tamales can be filled with meats, cheeses, fruits, vegetables, chilies or any preparation according to taste, and both the filling and the cooking liquid may be seasoned. The diversity of native languages in Mesoamerica led to a number of local words for the tamal, many of which remain in use. The Spanish singular of tamales is tamal. The English word tamale differs from the Spanish word by having a final vowel. In the pre-Columbian era, the Mayas ate tamales and often served them at feasts and festivals. The Classic Maya hieroglyph for tamales has been identified on pots and other objects dating back to the Classic Era (200–1000 CE), although it is likely they were eaten much earlier. Several different types of tamales are mentioned in Dresden Codex: iguana tamales, turkey tamales, deer tamales, and fish tamales. Tamale-making is a ritual that has been part of Mexican life since pre-Hispanic times, when special fillings and forms were designated for each specific festival or life event. Today, tamales are typically filled with meats, cheese or vegetables, especially chilies. Preparation is complex, time-consuming and an excellent example of Mexican communal cooking, where this task usually falls to the women. Tamales are a favorite comfort food in Mexico, eaten as both breakfast and dinner, and often accompanied by hot atole or champurrado and arroz con leche (rice pudding) or maize-based beverages of indigenous origin. Street vendors can be seen serving them from huge, steaming, covered pots (tamaleras) or ollas. The cooking of tamales is traditionally done in batches of tens or sometimes hundreds, and the ratio of filling to dough (and the coarseness of the filling) is a matter of preference. Instead of corn husks, banana or plantain leaves are used in tropical parts of the country, such as Oaxaca, Chiapas, Veracruz, and the Yucatán Peninsula. These tamales are rather square in shape, often very large— 15 inches (40 cm) or more— and thick; a local name for these in Veracruz is zacahuil, and these larger tamales are commonly known as "pibs" in the Yucatán Peninsula. Another less-common variation is to use chard or avocado leaves, which can be eaten along with the filling. In Belize, El Salvador, Guatemala, Costa Rica, Honduras, Nicaragua, and Panama, tamales are also wrapped in plantain leaves. The masa is usually made from maiz (dent corn in the US, not sweet corn, which is called elote). Guatemalan cuisine is known in particular for its hundreds of varieties of tamales; some popular ones include tamales de gallina (chicken), tamales dulces (sweet), and tamales de elote (in Costa Rica, the name can also refer to a type of corn pastry). In Guatemala, a variety of tamales is called tamales colorados, which have chicken or pork filling and a tomato-based sauce (recado), (hence the colorado, which means 'to blush'). It may also contain olives, red bell pepper, prunes or raisins, capers, and almonds. In Panama, where they are considered one of the main national dishes, tamales are fairly large. The most common fillings are chicken, raisins, onions, tomato sauce, and sometimes sweet peas. Pork is also used. 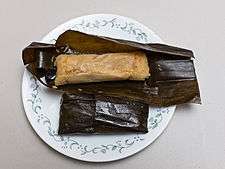 Another variation is Tamal en olla, or tamal in pot, which simply is the tamal mixture, not wrapped in either plaintain or banana leaves, and served directly from the pot onto plates. Tamales are usually served for all special occasions, including weddings and birthday parties, and are always found on the Christmas dinner table. Tamales in Costa Rica vary according to region and season. Most notable are the varieties from the Central Valley and Guanacaste. 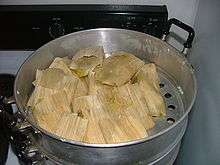 One sort of tamales, "tamales mudos" (mute tamales) are typically served during certain festivities throughout the year. Sweet tamales and corn tamales are popular during Holy Week. Tamales in Costa Rica are typically eaten with Salsa Lizano, a locally prepared Worcester kind of salsa. Another version, called a humita, is found in Peru, Argentina, Ecuador, Bolivia and Chile. It can be either savoury or sweet. Sweet ones have raisins, vanilla, oil, and sugar. Salty ones can be filled with cheese (queso fresco) or chicken. Humitas are cooked in the oven or in the pachamanca. They are not tamales by Peruvian and Argentine standards. In Chile, the food known as humitas is almost identical to tamales. In Venezuela, tamales are called hallacas. 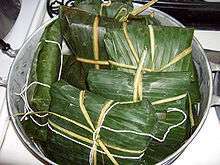 They are wrapped in plantain leaves and filled with a stew that may contain beef, chicken, pork, almonds, raisins and olives. They are traditionally eaten for Christmas. Also, the Venezuelan bollos are similar to tamales, wrapped in corn husks, filled with hot peppers or plain, and eaten as a side dish. Ecuador has a variety of tamales and humitas; they can be filled with fresh cheese, pork, chicken or raisins. 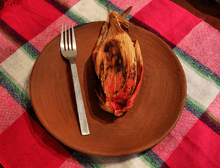 Ecuadorian tamales are usually wrapped in corn husk or achira (canna) leaves. The Indio International Tamale Festival held every December in Indio, California has earned two Guinness World Records: the largest tamale festival (120,000 in attendance, Dec. 2–3, 2000) and the world's largest tamale, [over 1 foot (0.3 m) in diameter and 40 feet (12.2 m) in length], created by Chef John Sedlar. The 2006 Guinness book calls the festival "the world's largest cooking and culinary festival." In 2016, March 23 was established as National Tamale Day. In the Philippines and Guam, which were governed by Spain as a province of Mexico, different forms of "tamales" exist. Some are made with a dough derived from ground rice and are filled with seasoned chicken or pork with the addition of peanuts and other seasonings such as sugar. 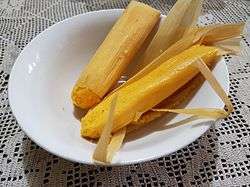 In some places, such as the Pampanga and Batangas provinces, the tamales are wrapped in banana leaves, but sweet corn varieties from the Visayas region are wrapped in corn husks similar to the sweet corn tamales of the American Southwest and Mexico. Because of the work involved in the preparation of tamales, they usually only appear during the special holidays or other big celebrations. Various tamal recipes have practically disappeared under the pressures of modern life and the ease of fast food. Several varieties of tamales are also found in the Philippines. Tamales, tamalis, tamalos, pasteles, are different varieties found throughout the region. Some are sweet, some are savory, and some are sweet and savory. Mostly wrapped in banana leaves and made of rice, either the whole grain or ground and cooked with coconut milk and other seasonings, they are sometimes filled with meat and seafood, or are plain and have no filling. There are certain varieties, such as tamalos, that are made of a sweet corn masa wrapped in a corn husk or leaf. There are also varieties made without masa, like tamalis, which are made with small fish fry wrapped in banana leaves and steamed, similar to the tamales de charal from Mexico, where the small fish are cooked whole with herbs and seasonings wrapped inside a corn husk without masa. The number of varieties have unfortunately dwindled through the years so certain types of tamales that were once popular in the Philippines have become lost or are simply memories. The variety found in Guam, known as tamales guiso is made with corn masa and wrapped in corn husks, and as with the Philippine tamales, are clear evidence of the influence of the galleon trade that occurred between the ports of Manila and Acapulco. 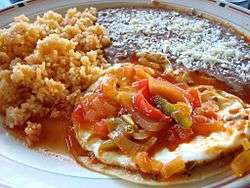 ↑ "tamale - English-Spanish Dictionary - WordReference.com". www.wordreference.com. Retrieved 2016-02-26. ↑ LeCount, Lisa J. (December 2001). "Like Water for Chocolate: Feasting and Political Ritual among the Late Classic Maya at Xunantunich, Belize". American Anthropologist. 103 (4). Retrieved 2013-12-15. ↑ Staller, John Edward; Carrasco, Michael (2010). Pre-Columbian Foodways: Interdisciplinary Approaches to Food, Culture, and Markets in Ancient Mesoamerica. New York: Springer. pp. 349–354. ISBN 978-1-4419-0470-6. ↑ Lawson Gray, Andrea (Jan 28, 2016). "Mexican foodways: Tamales and Candlemas". My Mission: Tastes of San Francisco. wordpress. ↑ Ken Albala (31 May 2011). Food Cultures of the World Encyclopedia: [Four Volumes]. ABC-CLIO. p. 34. ISBN 978-0-313-37627-6. Retrieved November 20, 2012. ↑ Ken Albala (25 May 2011). Food Cultures of the World Encyclopedia. ABC-CLIO. p. 300. ISBN 978-0-313-37626-9. Retrieved 4 August 2012. 1 2 3 4 Zeldes, Leah A. (Dec 18, 2009). "The unique Chicago tamale, a tuneful mystery". Dining Chicago. Chicago's Restaurant & Entertainment Guide, Inc. Retrieved Dec 18, 2009. ↑ "Hot Tamale Trail – Tamales in the Mississippi Delta". Tamaletrail.com. 2011-08-26. Retrieved 2013-12-15. ↑ All Things Considered. "Tamales, Another Treat from the Delta". Npr.org. Retrieved 2013-12-15. ↑ Zanger, Mark H. (May 1, 2007). 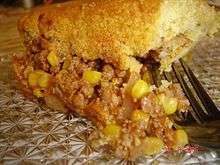 "Tamale pie". In Andrew F. Smith. The Oxford Companion to American Food and Drink. Oxford University Press. p. 581. ISBN 978-0-19-530796-2. Retrieved December 27, 2012.